The Shinkansen (新幹線, “new trunk line”), also known as the “Japanese bullet train” due to its shape and speed, is a high-speed passenger railroad system operated by the Japan Railways. The shinkansen connect most urban centres in Japan, running at a top speed of 320kph. They are extremely punctual, reliable, and have an excellent safety record: only occasional earthquakes and severe typhoons do stop the shinkansen. There have been no fatal accidents in almost fifty years of service. The Tōkaidō Shinkansen, which is the busiest route, running from Tōkyō to Ōsaka (JR Shin-Ōsaka Sta.) via Nagoya and Kyoto, operated by JR Central. The Sanyō Shinkansen, running between Shin-Ōsaka and Hakata (JR Hakata city in Fukuoka), operated by JR West. The Tōhoku Shinkansen, connecting Tōkyō with Aomori (JR Shin-Aomori Sta.) via Sendai, making it the longest Shinkansen line at 674km; it was extended to Hakodate in Hokkaidō through the Seikan Tunnel in March 2016. Hokkaidō Shinkansen, extending the Tōhoku Shinkansen from Shin-Aomori to Shin-Hakodate-Hokuto; it will be extended to serve Sapporo by March 2031. The Akita Shinkansen is run by JR East and links Tōkyō to Akita, using the Tōhoku Shinkansen tracks to Morioka. The Yamagata Shinkansen connects Fukushima with Shinjō in Yamagata Prefecture and is also run by JR East. 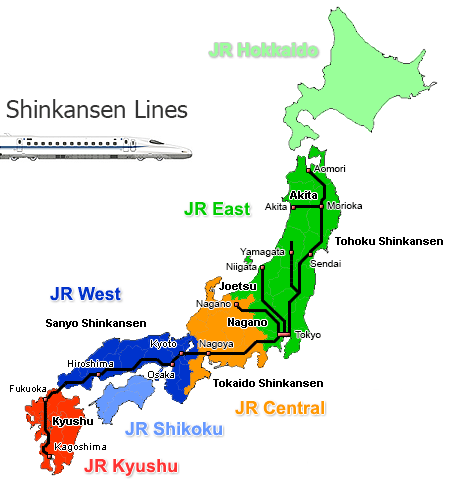 The Jōetsu Shinkansen heads north from Tōkyō and travels through tunnels to Niigata along the Sea of Japan, run by JR East. the Kyūshū Shinkansen run by JR Kyushu, connecting Hakata with Kagoshima Prefecture. The Tōkaidō and the Sanyō Shinkansen are the busiest high-speed train lines in the world, with 16-car trains running at mostly full capacity every 10 to 15 minutes. They run three different train services, the Nozomi (のぞみ), the fastest service that only stops at major stations, the Hikari (ひかり), and the slowest service, the Kodama (こだま) which stops at all stations and runs over shorter distances. Most shinkansen lines provide two kinds of classes, ordinary and Green Car, which offers more space due to their 2×2 seat configuration, as opposed to the standard 3×2 seating. While Green Cars are generally less crowded, they come at a hefty surcharge of 30 to 50% of the base fare. In 2011, the Tōhoku Shinkansen line introduced a GranClass, a first-class of sorts with additional amenities such as a spacious 2×1 seat configuration, on their E5 Hayabusa trains. While most shinkansen lines offer reserved and non-reserved tickets, some lines do require advanced seat reservations, such as the Hayabusa, Hayate and the Komachi trains on the Tōhoku Shinkansen. Green Car and GranClass seats always require a reservation. Non-reserved seats (自由席 jiyūseki) and reserved seats (指定席 shiteiseki) are in separate cars, which are prominently indicated on the platform as well as on the overhead train displays, in Japanese and English, and – depending on the station – sometimes in Chinese, Korean, and Portuguese. Non-reserved cars can be quite packed on public holidays like Golden Week or the during the New Year holidays. Shinkansen fees consist of the basic fare (乗車券 jōshaken) and the limited express surcharge (特急券 tokkyūken) that both increase in increments based on the distance travelled. Reservation fees depend on the season and come at 310, 510, or 710 JPY. Additional fees have to be paid for Green Car or GranClass seats. Shinkansen passengers have usually issued two tickets, one reflecting the base fare and the other the limited express fee. JR Rail Passes are available to visitors from abroad entering Japan as “Temporary Visitors”. They are available on all Shinkansen lines except for the Nozomi and the Mizuho lines. Seat reservations can be made at ticket counters and for some trains also online. The Japan Rail Pass must be purchased from an authorised sales office or agent outside Japan. JR-West Pass: JR West offers the Kansai Area Pass (for Osaka, Kyoto, Kobe, Himeji, and Nara), the Kansai WIDE Area Pass (for Osaka, Kyoto, Kobe, Himeji, Nara, Shiga, Tsuruga, Kinosaki Onsen, Wakayama, and Okayama), and the Sanyou Area Pass (for Osaka, Kyoto, Kobe, Himeji, Nara, Okayama, Hiroshima, Yamaguchi, and Hakata); all these passes offer discounts on a variety of tourist attractions and restaurants. What a fantastic rail system and oh how it must feel to ride the bullet train,we in the uk cannot imagine what a real train service would feel like,travel on the shinkansen is one mor thing I would like to do along with take the longest airplane flight Singapore to New York,if I could only do one then it would be shinkansen.